Rain falls more frequently on the windward side (eastern) of Grande Terre, New Caledonia’s main island. Whereas on the drier western side of the island you will find dry tropical forests, savannahs, and maquis scrubland, on the eastern slopes are the humid evergreen forests. These forests are dense with growth that is enclosed in a tree canopy of roughly 65 feet. Forest giants, especially species of Agathis, pierce the canopy. Gymnosperms (non-flowering seed plants) predominate and tropical conifers are common. 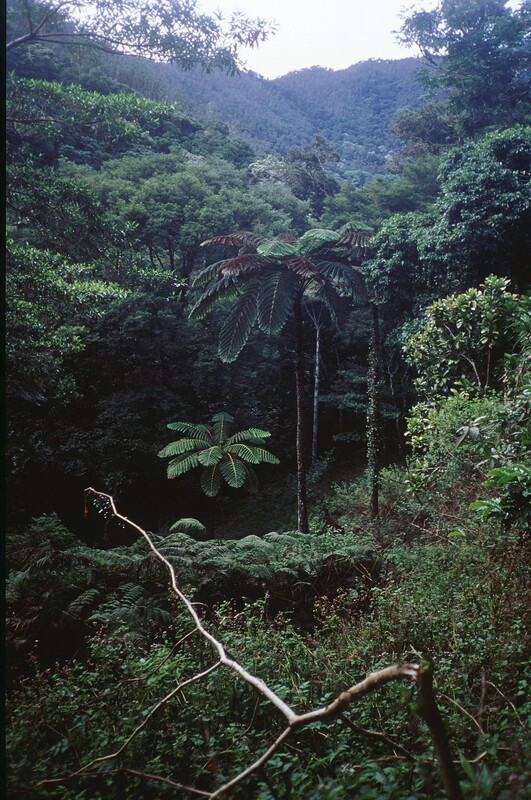 Humid evergreen rainforests once occupied over 70% of the New Caledonia but now cover only 22% of the land. The plant profiles that follow are a selection of the humid rainforest plants that are in the Atlanta Botanical Garden’s New Caledonia collection. 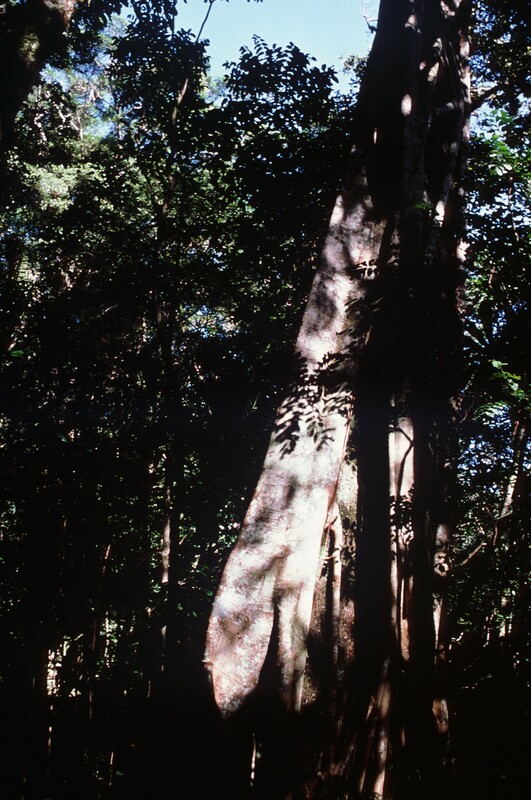 MOUNT PANIÉ KAURI Agathis montana (Araucariaceae) The mountain rainforest summit is the haunt of the aptly named Agathis montana. It was once thought to grow only on the summit of Mount Panie itself, but it is found throughout the entire range. Agathis montana (Araucariaceae) Photo © Bernard Surpin. Falcatifolium taxoides (Podocarpaceae). Young leaves of New Caledonia sickle pine flushed pink. Photo Tim Waters. NEW CALEDONIA SICKLE PINE Falcatifolium taxoides (Podocarpaceae) This citizen of the mountain rainforest understory is plenty interesting on its own, but it has a “fellow traveler” that makes it truly remarkable. The yew-like appearance of the tree’s foliage accounts for the scientific name, Taxus, being the genus to which yews belong. New Caledonia sickle pine also stands out because it has no near relations; no other Falcatifolium species is known to grow on any of the islands between New Caledonia and the western edge of New Guinea, where its closest relative, New Guinea sickle pine (F. papuanum) occurs. Another noteworthy characteristic of New Caledonia sickle pine is that it seems to have a companion in another Podocarpus species, Acmopyle pancheri, as the two are often found living together, or at least nearby. 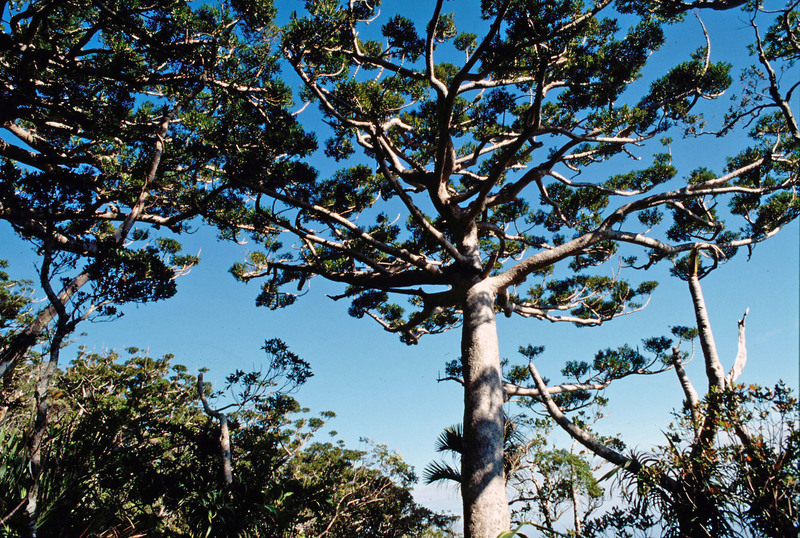 What makes the New Caledonia sickle pine truly extraordinary is that the tree is parasitized by another Podocarpus, Parasitaxus ustus, or coral pine — the only known parasitic Podocarpus. While New Caledonia sickle pines are common within their high to mid-elevation rainforest habitat, only a small portion of them play host, making coral pine quite rare. Growing at the base of its host, the coral pine is a shrub that rises to about 5 feet. Its coloring is quite striking: coral pine leaves and twigs are a reddish purple that some describe as “lurid” and which is the source of its scientific name ustus, Latin for “burnt.” The indigenous Kanak peoples regard coral pine as a sacred plant, and perhaps biochemical studies will reveal further reasons for this cultural status. 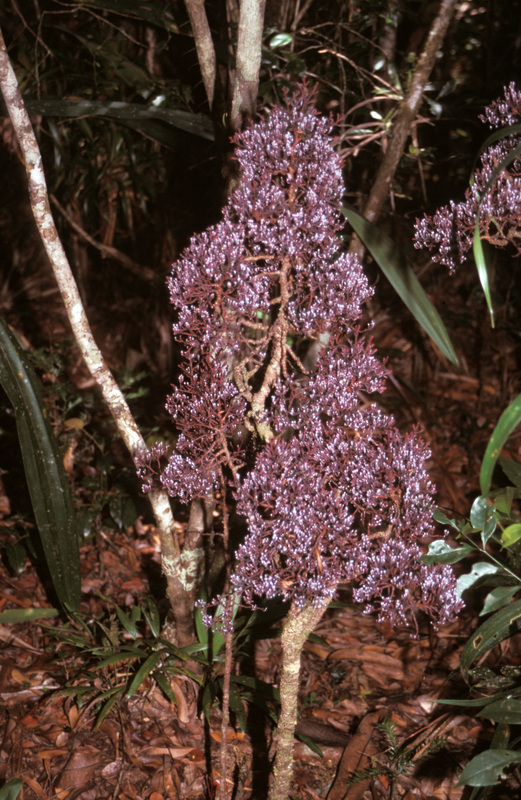 The New Caledonia sickle pine (Falcatifolium taxoides) and Acmopyle pancheri are included in the Atlanta Botanical Garden’s collection, while the coral pine is not, because, as of this writing, it is not in cultivation. Rainforest ferns of New Caledonia Adding to New Caledonia’s primeval appearance are some truly giant tree ferns. Among them are species from the Cyatheaceae family, which include the world’s largest tree ferns, with trunk heights in excess of 65 feet. The fronds of Cyatheaceae can grow 10 feet long, making them among the largest leaves in the plant kingdom. As a plant form, the tree fern has an ancient origin. Tree-like ferns were present in Carboniferous swamps, and by the Permian period, some 275 million years ago, forms very similar to those we see growing today were abundant. In some Kanak languages, the name for tree fern means “the beginning of the country of men.” Several clans tell creation stories in which the first human ancestor climbs out of a hollow tree fern trunk. In the Atlanta Botanical Garden’s collection are New Caledonian giant tree ferns from the Cyatheaceae family, including Cyathea intermedia and Cyathea novae-caledoniae. Palms of the rainforest While tropical conifers and other gymnosperms may dominate the rainforests of New Caledonia, palms are also present. 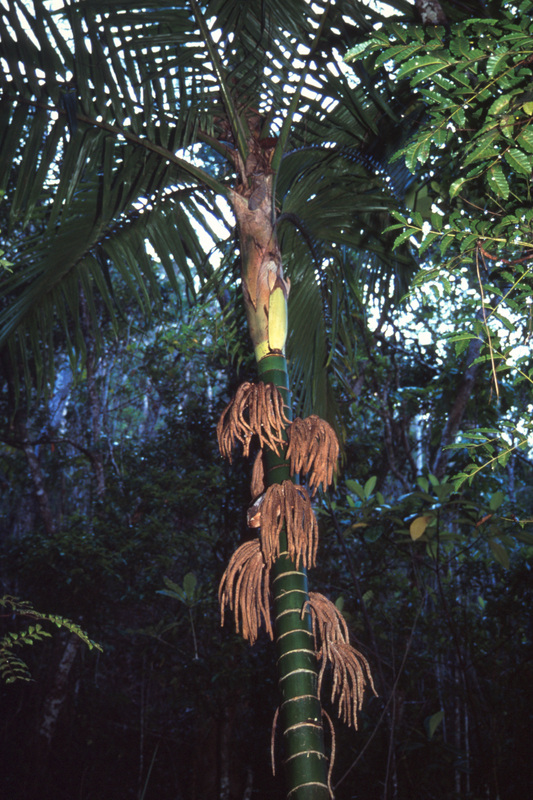 For instance, in the northern rainforests of New Caledonia grows a species of palm, Burretiokentia Hapala. 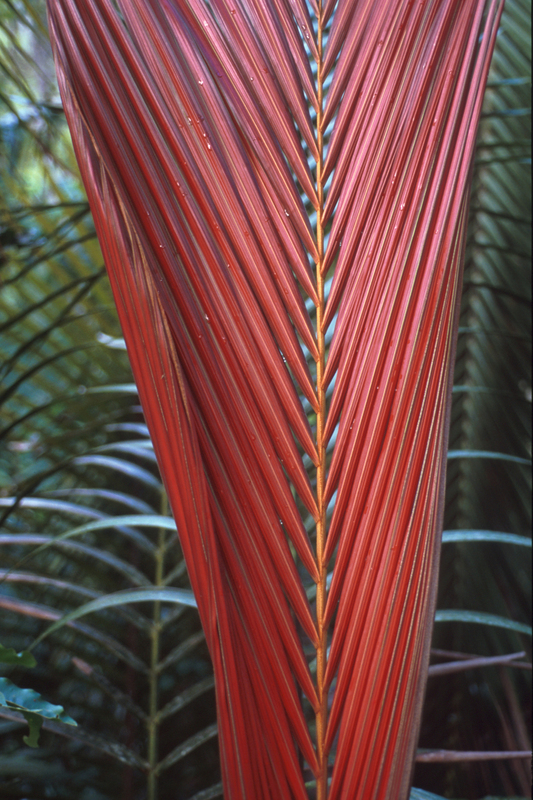 New Caledonia is also home to species of palms whose young fronds are red rather than a tender green. Kentiopsis magnifica is one, and another is Chambeyronia macrocarpa, also known as the red-leaf or flame-thrower palm. Both grow in the rainforests of northern Grande Terre, the main island. There are a number of red leaf palms in the Atlanta Botanical Garden’s Tropical Conservatory, so watch for new growth. the New Caledonian humid forests. 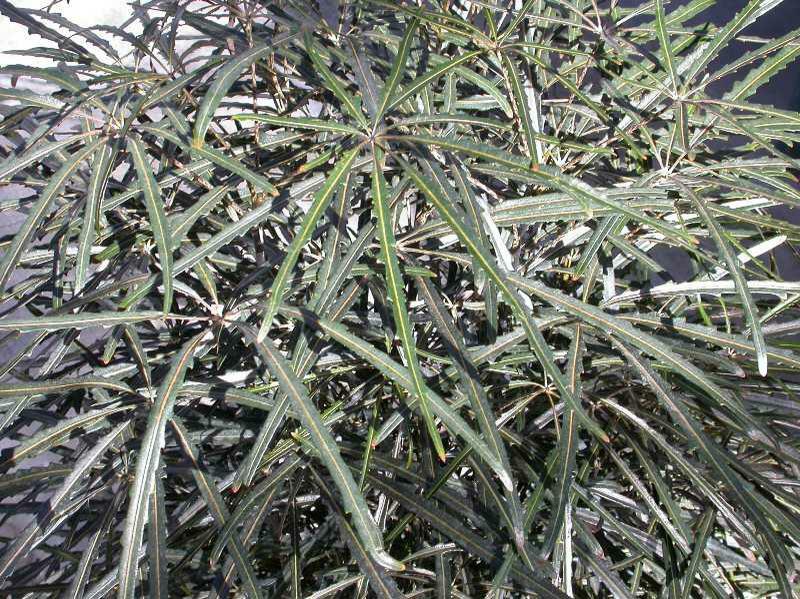 The taxonomy of false aralia has undergone a number of changes, so that it has several synonyms: Plerandra elegantissima, Schefflera elegantissima, Dizygotheca elegantissima, Aralia elegantissima. Whichever name is used, this plant cuts an elegant profile. 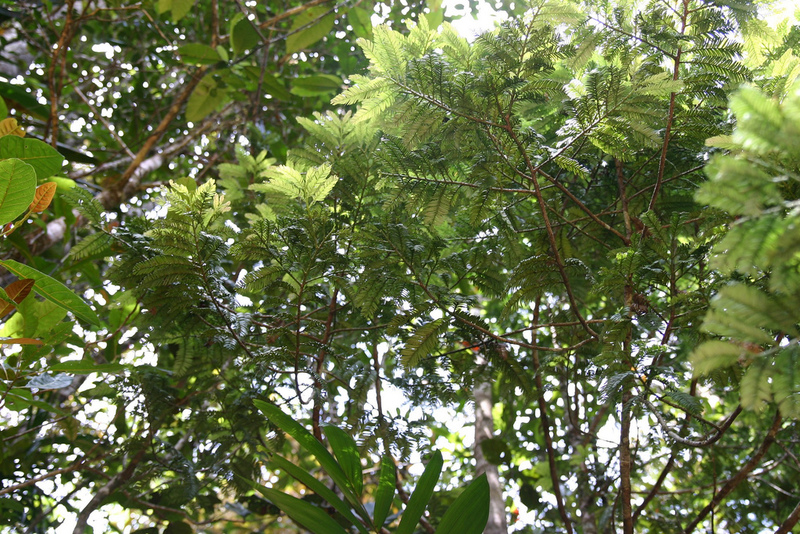 False aralia has deeply toothed leaves, glossy green on top and coppery red underneath. In its native habitat, it can grow into a 50 foot tree, while in your home false aralia keeps to a more manageable 6 to 8 feet. Like the rest of the plants in the humid forests of New Caledonia, the flowering plants are predominantly from ancient plant families that originated on Gondwana, also referred to as Antarctic flora. Among these old angiosperm families are Rubiaceae, Araliaceae, Myrtaceae, Sapotaceae, Proteaceae, Fabeaceae, and Clusiaceae. Here is a selection of rainforest angiosperms from the Atlanta Botanical Garden’s New Caledonia collection. Stenocarpus umbelliferus (Proteaceae) Photo Tim Waters. Bramwell, David. 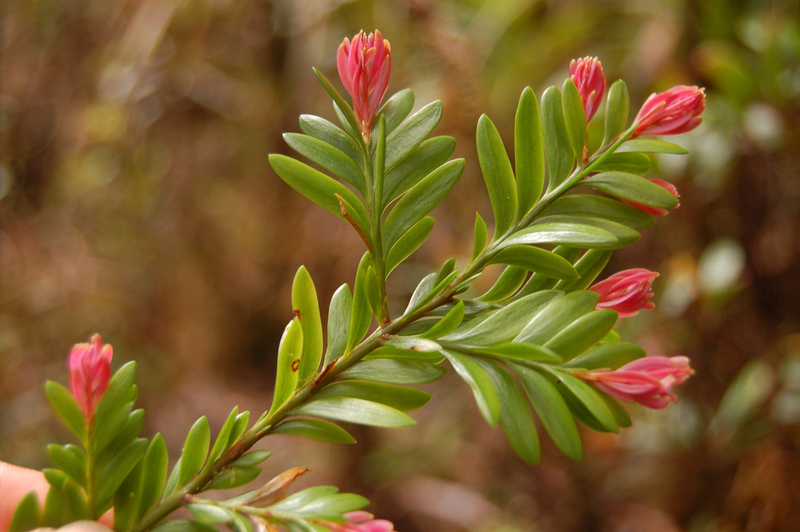 “Biogeography and conservation of the flora of New Caledonia.” The Biology of Island Floras. Ed. David Bramwell and Juli Caujape-Castells. Cambridge UP: Cambridge, 2011. 226-238. Eckenwalder, James E. Conifers of the World: The Complete Reference. Timber Press: Portland, 2009. Kasarherou, Emmanuel, Bealo Wedoye, Roger Boulay, and Claire Merleau-Ponty. Guides des Plantes du Chemin Kanak. New Caledonia: Agence de développement de la culture kanak, 1998. The Plants of New Caledonia website is funded by the Amborella Genome Project and the National Science Foundation and is sponsored by the Atlanta Botanical Garden.